Ever since I tried the vanilla back bacon from Waitrose, I've been trying to think of different recipes to cook with it. 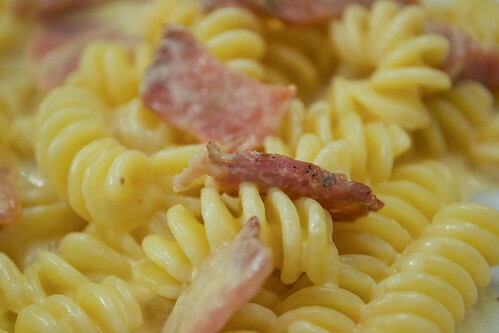 And constantly, one kept coming back into my head: vanilla bacon Carbonara. It was something about the musky-scented bacon, the soft pasta and eggy, creamy sauce that told me this would work so well. And it did. The vanilla flavour is subtle, it's not a sweet dish - but it's there, and just takes you up another level in the comfort food stakes. If they did streaky bacon cured with vanilla I'd be more tempted to use it in recipes - the fat doesn't melt down as easily so you have to cut it off before you start. So there you have it: vanilla bacon - not just for sandwiches. Put the pasta on to cook in slightly salted, boiling water. It will take about 10 minutes. Heat the oil in a pan and then cut the bacon up into bite-sized snippets and remove any large chunks of fat or rind, if there are any. Cook the bacon until just starting to get crisp. In a bowl, whisk together the egg yolks, cream and cheese. Once the pasta is cooked, drain, reserving about half a mugful of the starchy cooking liquid, and toss into the hot pan with the cooked bacon. Immediately turn off the heat and then tip in the eggy cream mixture, tossing it around to coat the pasta. Add a little cooking water to make a silky sauce. Serve hot, with extra Parmesan cheese, if you like. Would you try this? How would you cook vanilla bacon?